This is the most disorganized and unprofessional airline I've travelled with. My husband and I flew from Bellingham to Las Vegas. I spoke to a woman on the phone to find out how the seat selection works. She was very short with me I called a second time spoke to a different person who told me I'd be better off checking in at the airport as opposed to online if I don't want to pay and want to select 2 seats together because online it's computer generated but at the airport a real person will select seats for you. Upon arrival at the airport I was told that wasn't true regardless how you do it it's all computer generated. Our flight ended up getting cancelled due to fog and the plane landed at a different airport. It took them hours to give us this information even though they knew the flight had landed elsewhere. Finally we were told the flight would be the next day. No assistance was offered to help us with the cost of an overnight in a hotel. When a mob formed to complain they reluctantly offered names of several hotels that would provide a distress rate. On the flight the seats are pretty cramped and do not recline at all. Absolutely nothing was offered in the way of food beverages or reading material not even water. Initially you would think Allegiant is a much cheaper alternative but they charge you for everything. If you bring a carry on it's $13 in advance or $50 at the airport each way. For a checked bag it's $20 in advance or $50 at the airport each way. My partner and myself flew Delta to and from Grand Rapids without any difficulty. Unfortunately our daughter is on a budget and she booked with Allegiant Airlines. All I can say is take the "recommendation" to arrive 2 hours prior to your flight very seriously. They will sell your ticket right out from under you. My daughter checked in 45 mins before her flight out of Mesa AZ. She was told she was too late but watched in tears as others boarded the flight she was supposed to be on! The representative stated the next flight is next Thursday! Very cold and uncaring. 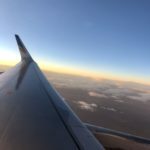 I travel from the Huntington and Charleston WV area to Orlando or St Petersburg Florida at least once a month and have done so for 5 years now. Allegiant has charged a one way price as cheap as $19.99 each way and as high as $249.99 each way. Prices are very weird. I understand their schedules and schedule problems. I don't understand their prices. 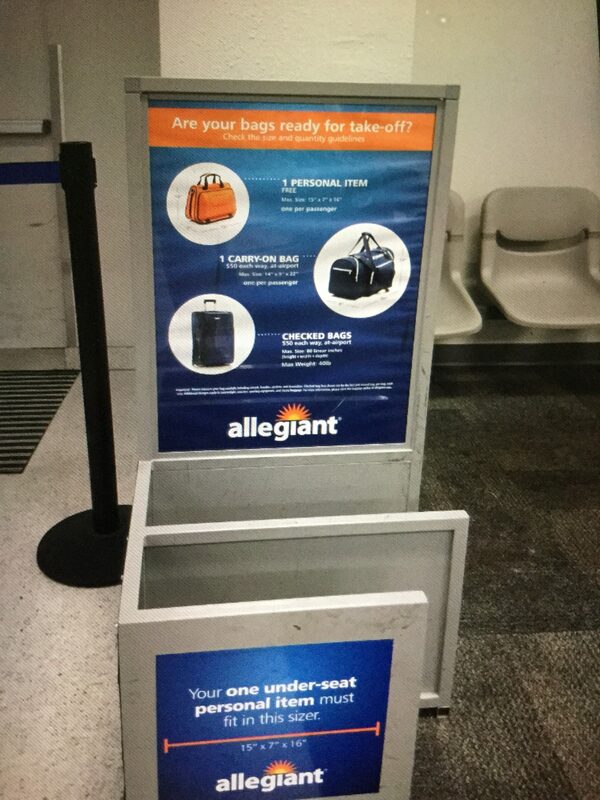 Allegiant is convenient for my travel plans but in 5 years they have made so many changes with booking baggage and especially seating. They never offer any kind of relief for any of their mistakes. Today I received an e-mail advertising a one way special to St Petersburg for $44.00 for dates 12-9 through 12-23. I immediately opened the website and tried to book at this price only to find out after a 45 minute wait on the customer complaint phone line that those prices sold out completely but there were plenty of seats available for $92. Gate personnel in Huntington have been very rude and even yell at passengers. Customer complaints and assistance by phone are put on hold up to an hour. Gate rules and booking rules are not enforced once on the plane. 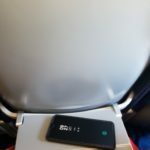 Such as overhead usage and seating. I will continue to use Allegiant but only if I can catch a good price. It is much more convenient consistent and comfortable to drive an extra 45 minutes to Columbus and book with Airtran. Two hour delay to ride on a plane with mechanical problems treated rudely not offered even a bottle of water for being delayed. Other airlines we have flown on have given us vouchers for food when we were inconvenienced. 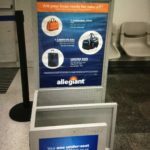 I witnessed an Allegiant employee laugh at a customer that had waited over an hour for her luggage. We stood in line with the other passengers on our flight for 15 minutes while three agents leaned on the counter and did nothing only to find out we were standing in a line that was for re-ticketing for a cancelled flight. The re-ticketing agent was telling passengers that they were in the wrong line one at a time as they requested their boarding passes. Our agent was very gruff and acted as though he was conducting some kind of military exercise. We were booked on Flight 541 from Monterey to Las Vegas on Sunday 10/6. After the plane was loaded a passenger had to be removed by security and the flight was then cancelled. This cancellation was not the airline's fault. But the flight the next day was scheduled for 5.35 pm and it was delayed until 7.30 pm. 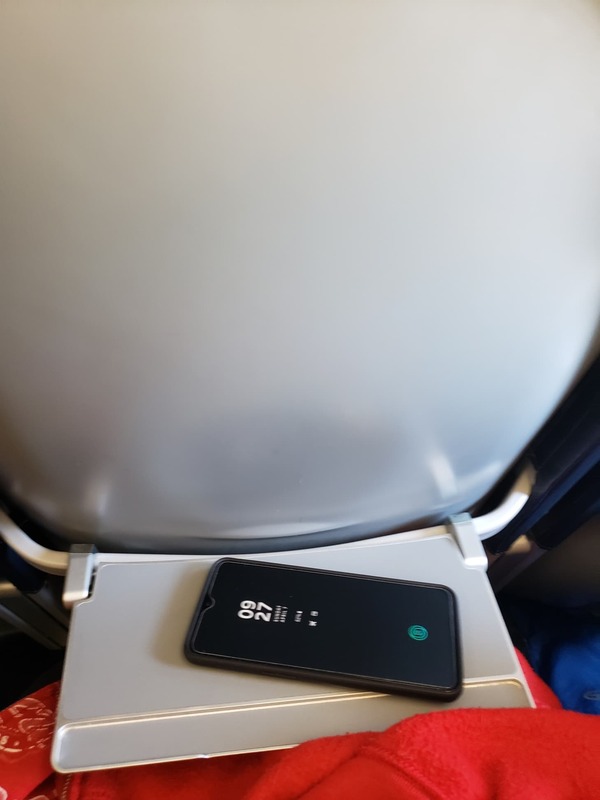 Then once we were all on the plane ready to go the auxiliary power unit would not turn on and there was another delay until they could get the engines started. We finally arrived in Las Vegas at 9 pm. Monday night. 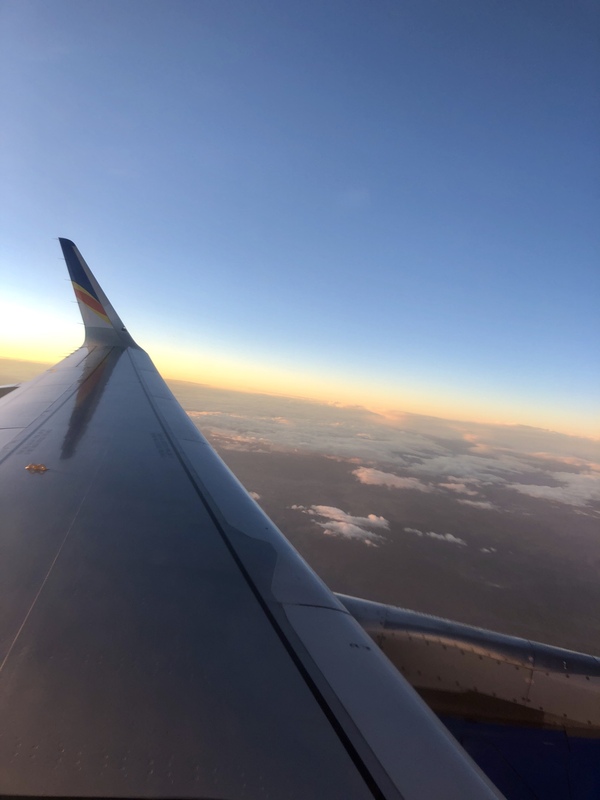 There were no problems with our return flight but after this experience and reading the other reviews I don't think we will take Allegiant again. Flew from GSP to FLL this week. Flight on time and arrived on time. Fly with Allegiant every month and have only had one issue with late departures. Friendly crew and clean aircraft. Just flew from St Pete to South Bend and back over the past weekend. We purchased and checked in online with no problems. They're a nice airline with friendly staff and clean fairly roomy planes. Our only issue was the punctuality problem they seem to have with everyone. Our flights were delayed both times by 20-25 minutes. Not deal killers but still annoying. Seems like they would be more concerned about maintaining their schedule but they don't apologize and everyone acts as if that's standard procedure. Feel free to leave the A/C on while we're waiting to depart or deplane. It gets stifling real quick. I will never fly Allegiant again. We were told that we had to arrive 2 hours before departure at the gate this morning at Oakland Airport. We were there on time at 7.30am for a flight to Provo Utah. A half an hour before departure they tell us they forgot to notify the 1st Officer that he was flying so we waited 1.5 hours for him to arrive. Once he got there we were notified the plane had been grounded and we had to wait for another to come from Las Vegas. Flight finally took off 6 hours late. The pilot was very apologetic and said we could have a free drink on the plane but when I asked for a bottle of water they said I could only have a cup! My husband missed his 40th reunion tonight because of their incompetence. When flying from Tri-Cities Tenn to Florida they are the only direct-flight game in town. We have used them for several years with minimal delays. They were particularly good at responding to the loss of several aircraft a few days ago. If money were no object I suppose we all would be using a chartered Lear but for most of us money is a factor and Allegiant provides reasonable service at an unbelievably low price. We travel frequently from Clearwater to Knoxville. We have been delayed at least once on each of the last 4 trips. If someone else would take over flying to Knoxville we'd switch.